Recent publications have proposed targeting lower hemoglobin levels (7 g/dL) to reduce complications related to transfusion of blood products, such as transfusion related infections, immunosuppression, transfusion-related acute lung injury (TRALI), hemolytic reactions and fever reactions, in addition to its effects on mortality. Anemia is common in critically ill patients, and is usually diagnosed after measuring the concentration of hemoglobin (Hb) and the hematocrit (Hct), which reveals the ratio between the existing red blood cells and the plasma volume . Anemia is defined as a concentration of Hb which is below the expected value, taking into account age, gender, pregnancy, and some environmental factors, including altitude above sea level  which leads to a reduction in the erythrocyte mass and hence in a lower ability to carry oxygen. The World Health Organization (WHO) has defined anemia as an Hb concentration less than 13 g/dL (Hct <39 %) in adult males, and less than 12 g/dL (Hct <36%) in adult, nonpregnant females . 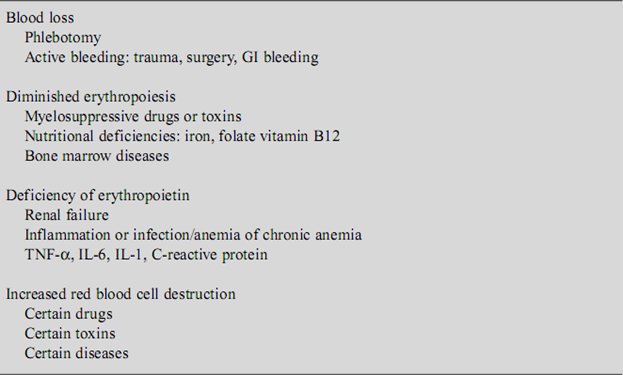 The condition of critically ill patients can worsen in the presence of anemia; however, aggressive treatment of anemia in these patients may be as harmful as no treatment . The incidence of anemia in patients admitted to the intensive care unit (ICU) varies depending on the population studied, and on the severity of the disease and on coexisting comorbidities. The ABC trial  reported an average Hb value of 11.3 (g/dL) at ICU admission; 63% of the patients had an Hb level lower than 12 g/dL on admission and in 29% it was less than 10 g/dL. In the CRIT trial , nearly two thirds of the 4,892 patients tested had Hb levels less than 12 g/dL on admission to the ICU. Anemia in critically ill patients is multifactorial and is hematologically similar to chronic anemia, but often patients experience acute onset anemia . Some of the causes (Table 34.1) can be modified, which may facilitate prevention strategies, such as making the collection of blood samples more efficient in order to reduce losses, guiding fluid replacement therapy to avoid extreme hemodilution, and the supply of iron. Nguyen et al. reported that during a patient’s stay in the ICU, the Hb concentration decreases by up to 0.66 g/dL per day during the first 3 days and then it continues to decrease at a rate of 0.12 g/dL per day. Similar findings have been reported in large observational studies [8,9]. The biochemical characteristics of anemia in critically ill patients include a low serum iron concentration, a low binding affinity for iron, a low ratio between serum iron and total iron, increased ferritin levels, reduced transferrin, low transferrin saturation with normal concentration of receptors for soluble ferritin, normal or high percentages of hypochromic red cells, and a normal or slightly increased concentration of erythropoietin [7,11]. During inflammation, normal erythrogenesis is inhibited, which contributes to critical illness anemia by a similar mechanism to that described by Weiss et al. for chronic inflammatory conditions . In addition, high circulating levels of proinflammatory cytokines, such as tumor necrosis factor (TNF)-a, interleukin (IL)-6, IL1, C-reactive protein (CRP), and interferon (IFN) a, ß, and γ, decreased production of erythropoietin, deficient erythropoiesis, increased free radicals, and a reduction in the average life of erythrocytes are also responsible for the appearance of anemia in less than a week [7,12]. When Should Critically Ill Patients Be Transfused? Different studies have attempted to determine at which Hb threshold a critically ill patient should be transfused. In the past few years, we have observed that the results obtained in these studies have positively influenced daily medical practice. One of the recent changes was in the guidelines published by the Surviving Sepsis Campaign in 2008, in which they recommend that adult patients suffering from severe sepsis whose tissue hypoperfusion has been resolved after the acute resuscitation period, and who have no prior record of ischemic heart disease, severe hypoxemia, acute hemorrhage, cyanotic heart disease or lactic acidosis should only receive a blood transfusion when the Hb concentration is less than 7.0 g/dL, in order to keep the Hb level between 7.0 and 9.0 g/dL (Grade 1B recommendation) . Although the optimal Hb level for patients with serious sepsis has not yet been established, the TRICC study , a randomized, controlled trial including 838 critically ill patients suggested that Hb levels between 7.0 to 9.0 g/dL, as compared with Hb levels between 10.0 and 12.0 g/dL, were not associated with increased mortality rates in adults. These findings support the suggestion that transfusions must be performed only when Hb levels are less than 7.0 g/dL. The exceptions identified in this study include chronic ischemic heart disease and acute coronary syndrome, in which the critical Hb level should be near 9.0 g/dL. A restrictive approach to transfusion should be considered on an individual basis, based on comorbidities and on physiological knowledge of the different phases of oxygen delivery (DO2), as proposed by Laks et al. in 1972  and Messmer in 1981 . These groups referred to hemodynamic changes as consequences of the acute normovolemic hemodilution technique . In the oxygenation phase, in which the union of oxygen to Hb depends on affinity, transportation, and delivery are not altered. The p50 changed only when the Hct levels were close to 10%, while DO2 increased up to 106% when the Hct levels ranged between 27.5% and 30% (Fig. 34.1) [15,16]. Tissue DO2 is altered in inflammatory processes because of changes in the structure of erythrocytes, resulting from the reduction of glycophorins in the cell membrane, which leads to a more spherical shape and a reduction in the capacity to be deformed. This in turn results in altered blood rheology, and a reduction in the concentration of intracell 2,3-DPG, conditions which alter the capture and delivery of oxygen at a tissue level [3,17]. Some studies have evaluated the impact of transfusion on prognosis in patients receiving mechanical ventilation. It has been suggested that blood transfusion might improve DO2 to compensate for the high demand for oxygen as mechanical ventilation is withdrawn . A study published by Hébert et al. compared the duration of ventilatory support and the rate of weaning success in 730 patients. One group received a restrictive transfusion strategy, and the other a liberal transfusion strategy. It was not possible to conclude that the liberal transfusion of red blood cells reduced the length of time during which patients required mechanical ventilation . Levy et al. performed a retrospective analysis of the database of the CRIT study, including 4,892 patients. The reasons for performing transfusions on patients receiving mechanical ventilation and on patients not receiving mechanical ventilation were compared. Nearly 60% of the included patients were receiving mechanical ventilation and had significantly higher APACHE II scores (p <0.0001). Patients receiving mechanical ventilation received more red blood cell units (Hb 8.7 g/dL on average) than patients with no mechanical ventilation (Hb 8.2 g/dL on average). Mortality rates were higher in the mechanical ventilation group (17.2 vs. 4.5%, p <0.001), as was the length of time they stayed in the ICU and the hospital. A large number of recent publications support the idea that anemic patients with underlying ischemic heart disease have poorer outcomes, as measured by several variables, than ischemic heart patients with higher Hb concentrations, defining anemia as any Hb concentration below 13 g/dL. Hébert et al. , in a multicenter, randomized, controlled trial including 838 patients, found that patients with heart disease and higher Hb levels had lower mortality rates as compared with those with lower Hb levels. A study by Zeidman et al. compared ischemic heart disease patients with and without anemia. Anemic patients experienced more arrhythmias and congestive heart failure and had higher mortality rates than nonanemic patients. Similar findings have been reported by others in patients with acute coronary syndrome, heart attack with or without ST-segment elevation, recurring ischemic events, and elderly patients younger than 70 with ischemic heart disease [22–25]. However, although the association between anemia and a negative prognosis in these patients is supported by evidence, the existing literature also shows that transfusions do not seem to be routinely prescribed . In normal physiological conditions, DO2 depends on the metabolic oxygen consumption (VO2). If DO2 is considerably reduced, so is VO2, leading to a critical condition called oxygen debt or anaerobic threshold. Transfusions are performed in order to resolve this situation, mainly occurring as the result of acute blood loss through hemorrhage, by increasing the erythrocyte cell mass and the blood volume. Transfusions are also used in clinical practice in order to increase DO2 , thus alleviating symptoms associated with anemia, such as fatigue, mental confusion, and adynamia, especially in elderly patients. If untreated, serious anemia may lead to anaerobiosis or tissue ischemia. However, the transfusion of red blood cells has not proved to be an efficient way of treating this situation [27,28]. The effects of transfusions on microvascular perfusion are not well defined. In anemic preterm infants, transfusion was associated with a significant increase in functional capillary density, as assessed by an orthogonal polarization spectral (OPS) probe applied to the skin of the upper arm . Functional capillary density increased already 2 h after transfusion and increased further after 24 h, indicating improved microvascular perfusion; there were no changes in clinical variables such as heart rate or blood pressure. In adult ICU patients with sepsis, we recently used OPS to investigate the effects of RBC transfusion on sublingual microvascular perfusion . Microvascular perfusion was not significantly altered by the transfusion of 1–2 units of leukocyte-reduced blood. There was, however, considerable interindividual variability. The change in capillary perfusion after transfusion correlated with baseline capillary perfusion, with baseline capillary perfusion being significantly lower in patients who increased their capillary perfusion following transfusion compared to those who did not. However, hemodynamic and global oxygen transport variables were similar in the two groups. Thus, the microcirculation in septic patients who already have microcirculatory changes may improve with transfusion. Similar observations have been made in anemic patients with traumatic brain injury. Leal Noval et al. 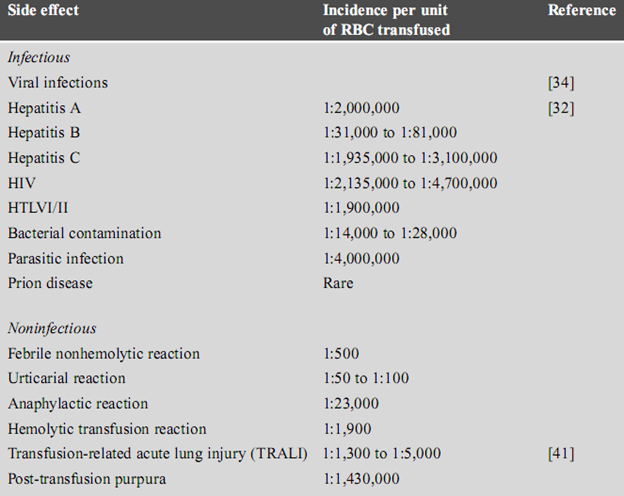 observed that RBC transfusions had a variable effect on brain oxygenation. Interestingly, cerebral oxygenation improved only in patients with altered cerebral oxygenation at baseline. Although microcirculatory blood flow was not directly measured in this study, it was estimated by a surrogate measurement (near infra-red spectroscopy). The transfusion of red blood cells may lead to well-known adverse effects, such as the transmission of viral infectious diseases [hepatitis A, B, C, human immunodeficiency virus (HIV)], bacterial and parasite infections (Chagas’ disease, malaria), and infections caused by prions. Noninfectious complications include volume overload, fever, anaphylactic, allergic or hemolytic reactions, TRALI, multiple organ failure, and a longer hospital stay [32–34]. In a study including 2,085 patients, Taylor et al. reported a higher rate of nosocomial infections in patients who had received transfusions than in those who had not (14.3% vs. 5.8%). The exact mechanism by which transfusions are related to higher morbidity and mortality rates and higher infection rates is not well defined. It is believed that immunomodulation and the transfusion of old erythrocytes could be likely causes [33–40] (Table 34.2). Different studies have reported an increase in mortality rates in critically ill patients who have received red blood cell transfusions during their stay in hospital [8,9]. Results from the ABC trial, which included 3,534 critically ill patients, revealed a 28-day mortality rate of 22.7% in patients receiving transfusions, compared to 17.1% in patients who did not receive a transfusion (p <0.02), showing that receiving a transfusion increased the risk of death by a factor of 1.4 . The CRIT trial yielded similar results . A recently published population-based cohort study by Kamper-Jørgensen et al. carried out in Sweden and Norway  on a total of 1,118,261 transfusions reported that the standardized mortality rate in the 3 months following the transfusion was 17.6 times higher compared with the general population; from 1 to 4 years after the first transfusion, the standardized mortality rate was 2.1 times higher, and 17 years later it was still 1.3 times higher. However, the SOAP study, which analyzed data from 3,147 patients in 198 European ICUs in May 2002 reported that, unlike the ABC  and CRIT  studies, transfusion was not linked to an increase in mortality rates in a multivariate analysis. Although the ABC and SOAP studies shared similar design and analyses, a plausible explanation for this important difference in results was the increased use of leukocyte-free blood at the time of the SOAP study . Leukocyte reduction is used to minimize the presence of white cells by means of centrifugation or filtration. Using this technique, it is possible to reduce the presence of leukocytes up to 99% and it has been effective in reducing the number of cell-associated viruses, such as cytomegalovirus, herpes virus, and Epstein-Barr virus. Leukoreduction may also reduce the transmission of parasites and prions, and the incidence of transfusion related fever reactions and TRALI [38–40]. Several million units of FFP are transfused every day (>4 million in England and the USA), and use of FFP has increased significantly in recent years. For example, in the USA in 1979, one unit of FFP was transfused compared to 6.6 units of red blood cells. In 2001, the ratio was one unit of FFP to 3.6 units of red blood cells [1,42]. This is possibly due to the fact that the number of invasive procedures is increasing and surgeons attempt to maintain available laboratory tests (PT, PTT, and INR) within normal ranges in order to prevent complications associated with bleeding . However, recent literature shows that the international normalized ratio (INR) and the activated partial thromboplastin time (aPTT) fail to predict which patients will suffer from bleeding as a result of an invasive procedure, and hence they should not be used to make decisions related to prophylactic procedures or transfusions . These tests were not developed for this purpose, but rather to explore hemostatic defects in patients already identified as suffering from coagulopathy. They fail to measure global hemostasis and cannot identify some coagulation defects; most importantly, they wrongly suggest the presence of defects which do not exist [1,43]. The belief that transfusion of FFP may correct mild to moderate coagulation defects is unfounded, as is the idea that the INR predicts bleeding, and that FFP corrects the INR in this type of patient. In the future, genomic applications will help to improve diagnosis and hence treatment . Until then, the recommendation is to use FFP in patients with massive hemorrhage or abundant bleeding with prolonged PT and aPTT (>1.5 times normal). The recommended initial dose is 10–15 ml/kg. Larger doses may be required depending on the diagnosis and the clinical situation . There is no scientific basis for defining a minimal platelet count as 20,000/µL. There is a real danger of massive bleeding when the number of platelets is below 5,000 to 10,000/µL and there is a risk of intracranial hemorrhage when the numbers are below 1,000/µL. Patients with chronic autoimmune thrombocytopenia may tolerate values between 5,000 to 10,000/µL for years and transfusion is not necessary in such patients, especially when their condition is stable . However, in severely traumatized patients with massive hemorrhage, it is recommended that the number of platelets be kept above 50,000/µL and when there is associated cranial trauma, it is suggested that the platelet count be kept greater than 100,000/µL. One possible explanation for this recommendation is that in these situations, patients have increased fibrin degradation products, disseminated intravascular coagulation (DIC), or hyperfibrinolysis, which interferes with platelet function and hence, a larger number of platelets could be beneficial. Evidence supporting this concept is, however, weak . When transfusing platelets, the suggested dose is 4–8 platelet concentrates or 1 unit of plateletpheresis . It is important to carry out a platelet count 15 min after transfusion. A poor platelet count may indicate the presence of HLA antibodies. A good count after 15 min but low after 24 h may reveal consumption related to fever, sepsis, drug toxicity, etc. .
Cryoprecipitates are useful to achieve a rapid increase in the fibrinogen levels in patients with DIC or in massive transfusion with hemodilution and active bleeding. 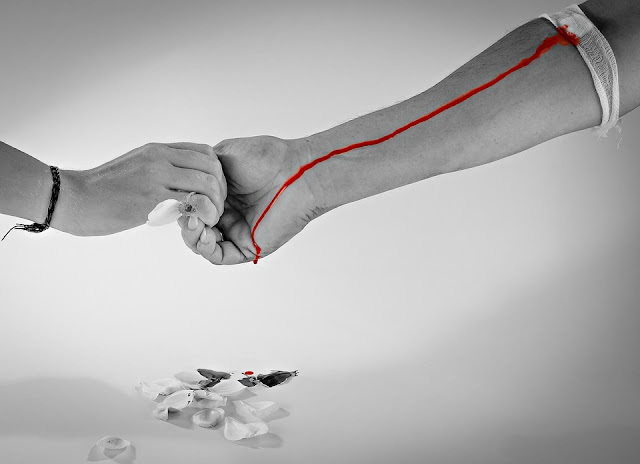 They are the third line of action in the treatment of von Willebrand’s disease type 1, and the second line of treatment for other types of von Willebrand’s disease. In trauma patients, evidence supporting cryoprecipitate use is very limited [42,43]. In cirrhotic patients during liver transplant, when low fibrinogen levels are often found, cryoprecipitates are very useful. It seems appropriate not to transfuse red blood cells to patients tolerating Hb levels of 7 g/dL (Hct 27%) when there is an adequate VO2/DO ratio. Imbalance in oxygen transport becomes evident when clinical signs of tissue hypoperfusion and lactic acidosis appear. It also seems to be clear that the transfusion of packed red blood cells can bring about serious complications as discussed above, which can increase the number of days in the ICU and in hospital and also morbidity and mortality. The above recommendation seems not to apply to patients with cardiac decompensation, elderly patients, and some neurological patients for whom hemoglobin levels of 10 g/dL are more appropriate minimum values. It is possible that leukocyte reduction provides some answers to some of the problems associated with transfusions, especially for patients not tolerating low hemoglobin or hematocrit concentrations. Further studies are required to provide solid evidence and make clear and precise recommendations to help us define more accurately the clinical use of blood derivates, such as FFP, platelets and cryoprecipitate, and to reduce the use of these blood products in cases where they are not indicated.